AmeriCommerce has teamed up with Chase to offer AmeriCommerce Payments, the fastest and easiest way to get paid in your AmeriCommerce store. See detailed information on all your transactions, and generate custom sales reports, right from your user-friendly AmeriCommerce dashboard. 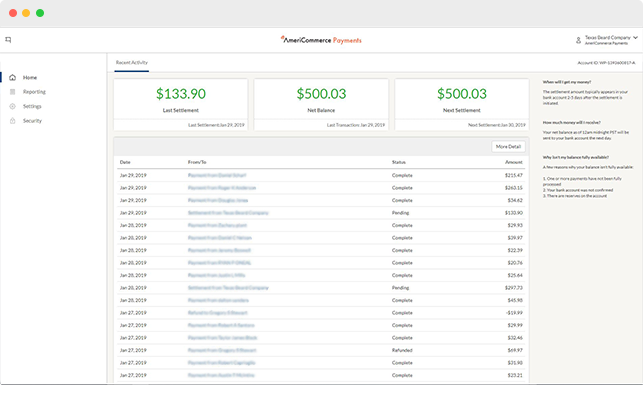 AmeriCommerce Payments automatically updates tokenized credit and debit card information kept on file. That means no more customer outreach when a card expires. Reach out to our US-based support team for any and all payments questions. AmeriCommerce Payments provides straightforward pricing, with fees netted out and no additional payment processing bills at the end of the month. With AmeriCommerce Payments you can apply directly inside your online store and be eligible to immediately take payments! Our dedicated fraud prevention team, and our robust fraud technology, help protect your business from bad transactions and chargebacks. You guys were the only ones that had the fraud and chargeback prevention we were looking for on our payments. See detailed information on al your transactions, and generate custom sales reports, right from your user-fiendly AmeriCommerce dashboard. Call 1-800-936-9006 now to learn more. Chase powers integrated payments for more than 1,000 software platforms. Chase's payments processing enables users to start selling in minutes, without compromising on the user experience or taking on risk and regulatory exposure. Who is eligible to sign up for AmeriCommerce Payments? AmeriCommerce Payments is available to users in the US and Canada at this time. The person who signs up must be a financial representative of your company and must be an account holder on the bank account you plan to receive your funds into. I am in the business of selling X. Can I process payments with AmeriCommerce Payments? Probably. AmeriCommerce Payments can process payments for most types of businesses and services, in the US, Canada, and UK. Of course, we do have limits - our credit card and banking partners prohibit us from processing payments related to certain activities, so you will want to visit Section 7 of our Terms of Service for a list of activities we cannot support. How much does AmeriCommerce Payments cost? > Steel and Bronze plans pricing is 2.9% + $0.30 for every card transaction. > Silver and Gold plans pricing is 2.6% + $0.30 for every card transaction. > Platinum plans pricing is 2.4% + $0.30 for every card transaction. > Higher level plans are eligible for review and can be negotiated based on past sales performance. There are no monthly fees, set-up fees, payout fees, or hidden charges of any kind with AmeriCommerce Payments. Because of our flat rate fee structure, you only get charged when you take a payment. AmeriCommerce Payments gives you the ability to accept credit and debit cards from all major card brands including Visa, MasterCard, American Express and Discover. 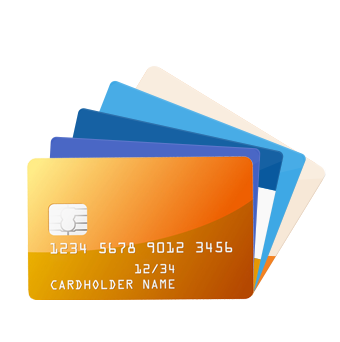 You are also able to accept lesser known card brands such as JCB and Diners Club. How do I make AmeriCommerce Payments my default payments processor? Our support team can assist you with this transfer. Feel free to enter a ticket in for assistance or give us a ring! Can AmeriCommerce Payments be used internationally? In order to accept payments with AmeriCommerce Payments, you must have a valid U.S. or Canadian bank account and address. However, you can accept payments from customers located anywhere in the world so long as they are paying with one of the supported card brands (Visa, MasterCard, American Express, Discover, JCB, Diners Club). Currently, you can accept payments in US and Canadian dollars. To accept US funds, you must have a valid US or Canadian bank account and address. You can accept payments from customers that live anywhere in the world, but you will have to charge them in the currency associated with where your account is registered. Your customer can pay with their local credit card, but their bank might charge them a conversion fee (and/or international payments fee). Who is WePay, a Chase Company? WePay, a Chase company, is the payments processor that powers AmeriCommerce Payments. With WePay, you can begin accepting payments in minutes with just a few pieces of information. Once you are ready to settle funds to your bank account, you can complete your account setup. To learn more about WePay, visit www.wepay.com. How does Chase protect my information? Protecting your security and the security of your customers is very important to us. We take a variety of safety and security precautions to ensure your personal data and payment data are kept safe at all times. To keep you safe, we utilize a combination of security technology, training and education, and vetted partners to ensure you have bank-level security while using AmeriCommerce Payments Powered by Chase. Why do some emails come from WePay? As our payments processing partner for AmeriCommerce Payments, WePay will send you email on behalf of AmeriCommerce Payments in regards to activity on your account and actions that may be required. If you have any questions about these emails, simply contact our support team here. Where do I go for more questions? AmeriCommerce Payments is fully supported by the AmeriCommerce Support team. All questions or issues can be directed to the Americommerce support team via email or phone. We are here 8AM-6PM (CST) Monday-Friday and will respond to your inquiry as soon as possiable. Why do I see references to AmeriCommerce Payments, Chase, and WePay? How are each of these entities involved in payments processing? AmeriCommerce Payments is the online payments solution developed by AmeriCommerce. You can sign up for AmeriCommerce Payments in your AmeriCommerce dashboard, and begin accepting payments in minutes. The underlying technology for AmeriCommerce Payments is powered by WePay. WePay provides the back-end infrastructure to process payments and deposit money into your bank account. WePay was acquired by JPMorgan Chase in December 2017. WePay has replaced the WePay name with the Chase name in their solution. However, you may still see some references to WePay in the AmeriCommerce on-boarding experience and in the emails that you receive. Over time, you will see fewer mentions of WePay and more references to AmeriCommerce Payments, Powered by Chase.